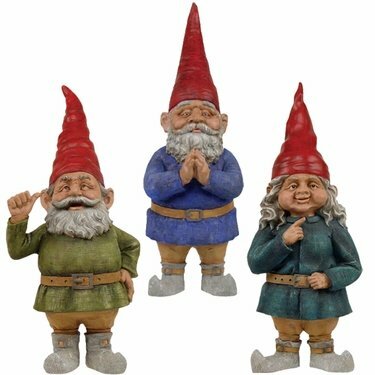 Once you invite our happy Toad Hollow garden gnomes into your yard, the place will never be the same again – and we mean that in a good way! These cheerful masters of the forest will be right at home in your garden, on your patio or among the trees in your backyard. This set of 3 figurines will let you create your very own Toad Hollow garden decor, and you can put them in different settings – by a tree, at the front door, near a large rock, standing by a toad stool or among your roses. This set is 20 inches tall and features Rumple, Zelda, and Mordecai. Our garden gnomes are all cast stone and weather-resistant.